Draconian is a Gothic metal ensemble that employs both male and female lead singers, a tactic that allows Where Lovers Mourn much more versatility than your average doom-laden operatic metal album. Draconian's epic songwriting is obvious by the opening dirge "The Cry of Silence", a track which sets the tone for the eight-track endeavor that covers the pain of heartbreak. Giving it to the audience slow, deep, and hard, the melodic musings and melancholy movements of songs such as "A Slumber Did My Spirit Seal" mix folksy undertones with driving Goth rock, creating a sweeping concoction of enchantment and despair. 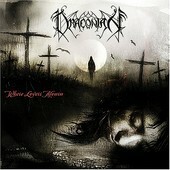 Not exactly party music, Draconian's dour delivery and pure passion make this CD something for the Lacuna Coil and Type O Negative crowd.